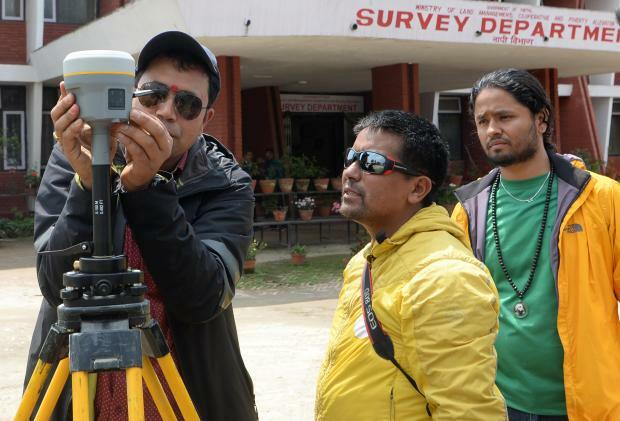 Nepali survey chief Khim Lal Gautam (L)along with his team, Suraj Sing Bhandari(2R), Yubaraj Dhital (R) and Mountain Guide Tshiring Janbu Sherpa (2L) check the equipments before leaving on an expedition to remeasure the height of Mount Everest. In May 1999, an American team added two metres to Everest's height when it used GPS technology to survey the peak. That figure is now used by the US National Geographic Society, but otherwise not widely accepted.